Vinay Pradhan, the Meerut district president of the Congress party was removed from all positions of the party on Tuesday after he was found using the word Pappu in order to refer to Rahul Gandhi, though in a positive contenxt. This decision to remove him from all party positions was taken by Uttar Pradesh Congress Committee (UPCC) chief Raj Babbar. The word Pappu is held as synonymous with Rahul Gandhi by his critics and roughly translates to someone who is either dumb or an idiot. Vinay used it in context of ‘giving it back’ to the critics, but ended up getting flak. 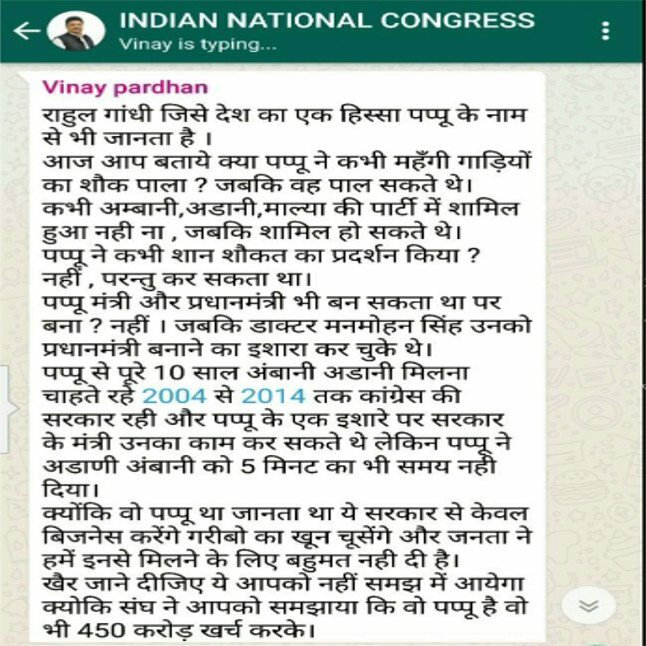 The word was used by Vinay in a Whatsapp message, which he shared in a group of Congress leaders and supporters, perhaps hoping to get brownie points for defending Rahul Gandhi. In fact, he, as a disciplined Congress worker, used the usual pro-poor rhetoric of Rahul Gandhi as facts. For those who can’t read Hindi, the message begins with stating how a ‘section’ of the nation knows Rahul Gandhi as Pappu. The message then talked about how this ‘Pappu’ (addressed to that ‘section’) apparently chose to lead an austere life by not using flashy cars and avoided going to parties hosted by Ambani, Adani and Mallya. It then talked about how this ‘Pappu’ had forsaken the post of Prime Minister and allowed Manmohan Singh to stay at the helm. The message ends up with an attack on RSS, accusing the Sangh of spending 450 crore rupees to malign the image of Rahul Gandhi as ‘Pappu’. However, this passionate defense of Rahul Gandhi and attack on RSS was lost on the leadership of Congress party. Ignoring the context of his message, the state leadership decided to banish Vinay from the party. This incident is somewhat similar to blasphemy laws in Pakistan, where you can not repeat blasphemous words even in different context. Repeating the blasphemous words, say for the purpose of reporting, can also be constituted as blasphemy. Similarly it seems, just uttering the word Pappu in any context would mean blasphemy for the Congress party and the person will have to suffer consequences.